If you try to clean an oven without any advanced tools and detergents, you will probably spend nearly a full day scrubbing and wiping it only to end up with a rather disappointing result. We, from Cleaning Uxbridge, are ready to come to your rescue with our flexible and efficient oven cleaning service in Uxbridge. We can sanitise various types of ovens and cookers, at that, we will wrap it all up in a matter of a couple of hours or even faster than that. It won’t be an overstatement to say that we have the most reliable team of skilled oven cleaning technicians in Uxbridge. Our diligent and trustworthy staff is highly trained, well-versed and incredibly polite and they will clean your oven in such a thorough way that they will leave no trace of grime, grease or gunk on it. We have hired only responsible professionals so they will waste none of your time during the appointment. As soon as they arrive at your property, our attentive and competent oven cleaner will inspect your cooker to assess the state of the appliance. After that, our dependable professional will check whether the oven is working properly. Once that quick test is done, the cleaner will proceed to remove the racks of the oven. If possible, the door or the doors of the appliance will also be disassembled. In that way, the cleaning process will be carried out in a more meticulous and effective way. The next step involves the cleaning of the interior of the oven. Our qualified cleaning specialist will scrub that part of the cooker and soak its racks in a special solution for a few minutes. After that, the vetted pro will clean the exterior of the appliance, removing all dirt, food debris, burnt food and etc. from its surface. The oven will be completely assembled after every part of it has been carefully cleaned. Finally, our courteous cleaning technician will test whether the cleaned cooker works properly. There are rarely any surprises but we always want to make sure that your oven is not only properly cleaned but also fully operational before we leave. 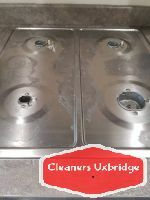 Our all-round oven cleaning in Uxbridge is really thorough because we rely on modern cleaning tools and our insured cleaners have so much experience in the industry that they can sanitise even the dirtiest and greasiest cooker in a really short amount of time. Apart from being time-efficient, our convenient oven cleaning service in Uxbridge is also quite budget-friendly. We will provide you with a full oven cleaning for only £77 and with a double oven cleaning for barely £63. Our dedicated professionals are also equipped to clean smaller cooking appliances such as microwaves, gas and ceramic hobs, as well as single extractors. The price of having one of those cleaned in a professional manner is only £14. And let’s not forget our remarkable offers one of which will provide you with a single oven and hob extractor cleaning for barely £75. 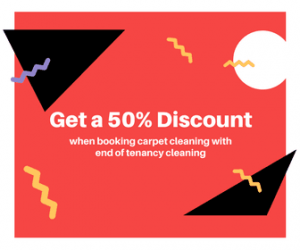 We will take things even further by giving you a free oven cleaning if you book us for a reliable end of tenancy cleaning worth over £100. By hiring us, at Cleaning Uxbridge, for the thorough cleaning of your oven, you will add a few more years to the appliance’s lifespan. Plus, our professional oven cleaning service in Uxbridge will make your food taste better since your cooker will no longer smell funny or smoke for no obvious reason.